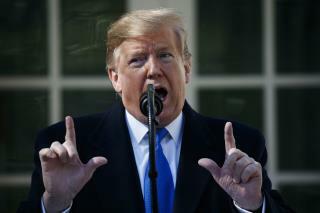 (Newser) – In case you left Earth recently, President Trump has declared a national emergency to free up funds for his border wall. And now, as he predicted, lawsuits are on their way. The first one comes from the liberal non-profit Public Citizen, which says there's no actual emergency at the border, and Trump's declaration undermines the separation of powers because Congress already said no to wall money: "...A disagreement between the President and Congress about how to spend money does not constitute an emergency authorizing unilateral executive action," the group argues, per BuzzFeed. Three of the lawsuit's four plaintiffs are landowners who were told by the federal government that parts of the wall are slated for their properties. I don't know why liberals, independents, or Democrats are upset by this; Just wait until the next Dem POTUS declares a national emergency after a mass shooting with an assault rifle, or another coastal city in the US is destroyed after a cataclysmic event caused by VERIFIABLE data on climate change that does not contradict the administration's stats on a BS claim of causation, consequence, or origin like the trump admin's does. It's gonna be FANTASTIC. Sometimes it's great news when some moron dooshbag redefines the laws in their favor; something many, many GOP officials have already realized which is why they are opposing this declaration of a fictional invasion / national emergency. Donald is going to end up so broke that even a law student would refuse to defend him in court.